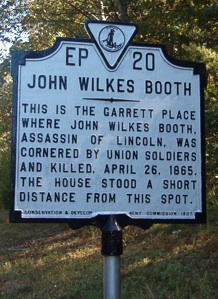 Born on a farm near Bel Air, Maryland, on May 10, 1838, John Wilkes Booth was the ninth of ten children of Junius Brutus Booth (see photo below) and Mary Ann Holmes. John's parents had moved to the United States from Britain in 1821. His father Junius was one of the most famous actors on the American stage. John took to the stage as well, and followed in his father's footsteps. In 1860 his career really took off and he was earning great money. On April 14, Booth stopped by at Ford's Theatre to pick up his mail. At that time, he was told that President Abraham Lincoln was planning to attend the evening performance there of the play entitled Our American Cousin. It was during the performance of that play at 10:15pm that John Wilkes Booth shot him. Just a short time later, at around midnight, Booth and his accomplices stopped at Surratt's Tavern in Maryland to pick up some weaponry. The next day, the group stopped at Dr. Samuel Mudd's house to have John's injured leg set. A day after that, on April 16th, they sought assistance at the home of Samuel Cox. 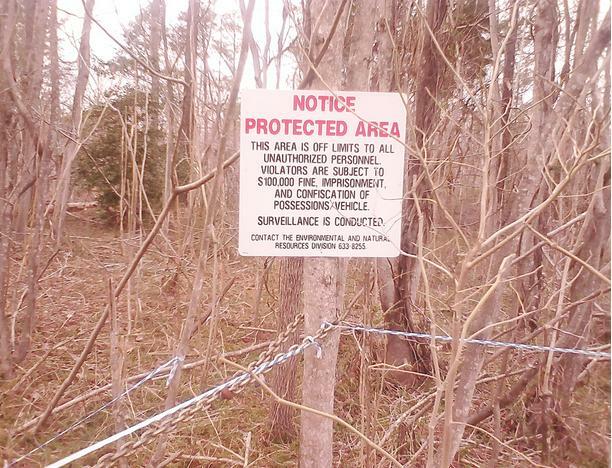 He wasn't much help so from April 16 through the 21st, they hid in the woods near the Potomac River in Maryland. On the 22nd, they set sail for Virginia but mistakenly went upriver rather than across. Eventually, they found their way and found a cabin on Lucas' Farm to sleep in the next day. 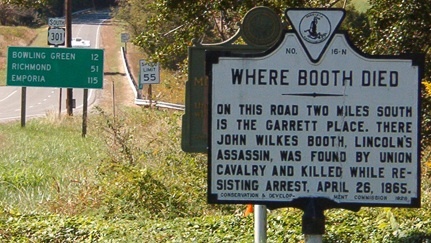 On April 24, they crossed the Rappahannock River and arrived at Garrett's Farm near Port Royal, Virginia and the next day, the group was captured by soldiers there at the farm and John Wilkes Booth was shot.